The Pro-Am Games were conceived in Miami Beach in 1996 as a way to give young Hip Hop Dancers & Artists a legitimate stage to compete on. The 2014 event will feature competitions & workshops in 12+ Dance Categories, Skateboarding, Martial Arts, Tricking, Basketball, Beach Run, Boot Camps, Parkour, Yoga, Qi Gong, a Kids Summer Camp and much more. At the time of its conception, there were no organized conferences or competitions of the sort in the United States. 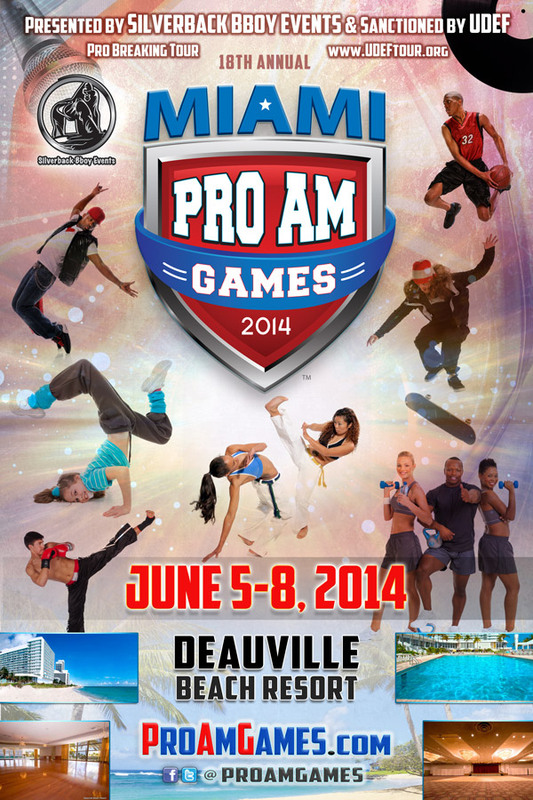 The Miami Pro-Am took the world by storm and revolutionized dance events all over the globe. While it was common for most events to only feature one or two team categories for Hip Hop Dance, the Pro-Am was often running 10 or more events and introduced new categories to the international competitive dance scene like: Power Moves, Popping, Locking, Up Rock, B-Girl, Veterans Battles, Bonnie & Clyde, Abstract Styles, Pee Wee battles and more. At the same the time, the event was also holding live art shows, panel discussions, workshops, DJ, MC & Beat Boxing battles. The ProAm generally runs Wednesday-Sunday and has been held at many historical venues in Miami Beach and downtown. The 2014 event is being held at the legendary Deauville Beach Resort in Miami Beach, where Frank Sinatra, The Beatles and many other icons have performed and stayed at. In the last 17 years, the event is the largest of its kind in the Southeastern United States and has attracted thousands of people from all over the world, locals, celebrities and entertainers. In addition, it has been one of the most important cultural events in the region for providing work, mentoring and exposing the next generation to the arts as a method of employment and a healthy lifestyle. The ProAm is directly responsible for preparing and giving opportunities to some of the best dancers and artists in the world that have been seen in every film, music video, television show and tours. Furthermore, the ProAm is the only event who has consistently brought together more Hip Hop Pioneers than any other organization in the history of the region. The ProAm mission is to teach the youth the right way, the original way, directly from the source. We have worked tirelessly to make sure the history of the culture is presented in a positive light by the originators of the individual dance styles, rap game, dj scene and art world. The event was founded by Legendary Hip Hop Dancers Richard “Speedy Legs” Fernandez & Steven “Zulu Gremlin” Roybal. In 1998, Jonathan “DJ Trails” Fields came on board as a partner with Speedy Legs and Hip Hop Elements.